Habit: Perennial herb, shrub, tree, strongly aromatic, occasionally thorny. Leaf: generally alternate, simple or compound, dotted with minute, translucent glands; stipules 0. Inflorescence: cyme, raceme, or flowers 1, generally bracted. Flower: generally bisexual; sepals, petals each 4 or 5, free or fused at base; sepals generally persistent; petals generally +- white or +- green; stamens generally 2--4 × petal number; ovary superior, generally lobed, chambers 1--5, ovules 1--several per chamber. Fruit: berry, drupe, winged achene, or capsule. Seed: generally oily. Genera In Family: +- 158 genera, +- 1900 species: especially tropics, warm temperate, especially southern Africa, Australia; used or cultivated for food (Citrus, 20--25 species), perfume, medicine, timber, ornamental (Choisya, Skimmia, etc). Toxicity: Some TOXIC: oils may cause sunburn or dermatitis. Habit: Subshrub or shrub. Leaf: simple or divided into 3 segments, alternate, minute, seasonally deciduous. Inflorescence: panicle (raceme-like or flowers scattered along stems). Flower: bisexual; sepals 4, fused at base, persistent; petals 4, erect in flower; stamens 8, in 2 series; ovary stalked or sessile, 2-lobed, style thread-like. Fruit: capsule, opening at tip, 2-lobed, leathery. Seed: 1--11 per chamber, +- smooth or tubercled. Stem: 3--6 dm, broom-like, +- yellow-green, densely gland-dotted, generally leafless. Leaf: simple, 0.5--1.5 cm. Flower: sepals +- 2 mm, ovate, +- green; petals 8--12 mm, elliptic, dark purple, tips reflexed; ovary stalked, ovules 3--8 per chamber, style well-exserted. Fruit: lobes +- 5 mm wide, +- spheric. Seed: 1--4 per chamber, +- 4 mm, reniform, +- smooth, +- brown. 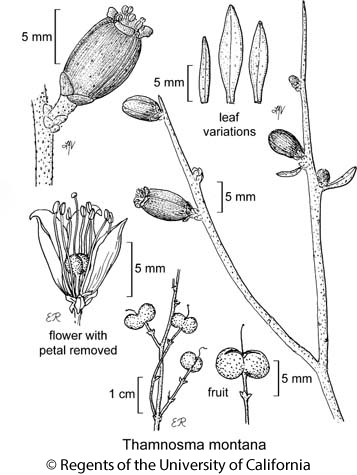 Citation for this treatment: Lindsay P. Woodruff 2012, Thamnosma montana, in Jepson Flora Project (eds.) Jepson eFlora, http://ucjeps.berkeley.edu/eflora/eflora_display.php?tid=46311, accessed on April 19, 2019. PR, D; Markers link to CCH specimen records. Yellow markers indicate records that may provide evidence for eFlora range revision or may have georeferencing or identification issues. Purple markers indicate specimens collected from a garden, greenhouse, or other non-wild location.